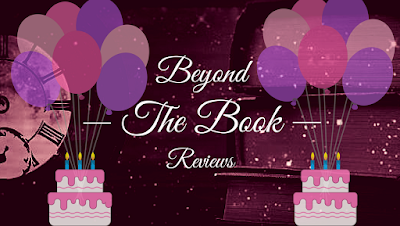 HAPPY BIRTHDAY TO BEYOND THE BOOK REVIEWS! How exciting is this? To think that I decided to go and create a bookish blog two years ago. This past year has been such a fulfilling experience. I have come so far in the book and blogging community, and I have met so many amazing people. Some whom even live in my city. One thing that makes this year even better than the last is the countless and contiunious support I get from my readers. I value each and every single comment, as well as the countless views on each post. It means the world to me to know that there are people out there who take the time to follow and look at my blog. So thank you to the readers who have been there since the start, and thank you to those who just recently decided to take a chance on me. IN this post I will be sharing some highlighted moments and accomplishments that have taken place within the past year. Some thank you's and honourable mentions to some bloggers who I have met and couldn't have survived the year without. ALSO at the bottom I'll have a total of 4 giveaways. So without further ado, lets get to sharing. Over this past year I have managed to continue my "Author of the Month" and "Blogger of the Month" two features I hold dear to my heart. These were two original features I started on my blog an though these posts haven't been as frequent, I still love posting these. I have had some reappearances on my blog, as well as some spectacular new faces here. All of which was worth it. Another feature that i loved and must highlight actually just finished up two days ago. It was a feature I called "Reader's Response Week" and this feature included an interview with an author from every YA genre I have come to love. This feature included a mini review of the book as well as an in-depth look at one of the author's book. It was a fun feature that was created out of an idea I had for an English assignment. A highlight for this past year would be the two read alongs I hosted and helped out with. My first ever read along took place back in October for Kerri Maniscalco's book Stalking Jack the Ripper. This to say the least was a very fun thing to host and come up with. I had some terrific help from Kerri Maniscalco herself as well as the lovely blogger Ava over at Bookiness and tea. This read along included a wonderful blog tour as well as some awesome goodies and rewards. My next read along was more of one that I helped organize and host. That read along was for The Alchemists of Loom by Elise Kova, and I had an absolute blast helping the very kind author out. This one was fun to host because for me it was a third reread, but still very rewarding with daily questions to be active with. This past year I got the opportunity to get to know a lot more bloggers whom I had been talking to before for a while. My first thanks must go out to the amazing blogger Booknut101, she is such a sweet heart. She's been an amazing friend and this past year we have had the opportunity to create more blog posts together as well as many more guest posts. This past year I also got the opportunity of meeting some fellow bloggers that live in my city. These lovely ladies have been so amazing and I love every chance I get to interact with them. These ladies are: Stephanie from OhanaReads, Kristie from Lost in Ever After, Lauren, Mari and Ola from The Autumn Bookshelf, Joy from Joyousreads, Sara from Just Another Story and Aneta from Angelic Book Reviews. Thank you for letting me in, and becoming such wonderful friends of mine to whom I really enjoy talking with. Another thanks is needed for my dear friend, a friend who shares the same date as this blog, almost. This thanks goes out to Alexis (Blogger over at Mad For Books, Luv) You have been the best Travel Buddy ever (only you will understand the name). You understand my craziness and embrace it. You're always there to talk too, and you are truly a great person. You're a cherished friend, and I await the day we can meet IRL. I can't believe tomorrow marks the day we started talking two years ago!! This thanks goes out to all the publishing houses who take chances on me and continuously send my books to read and review. Half of my posts would not be possible without you guys and I am so grateful for all the amazing books I have received thus far. My final thanks goes out to every reader new or old who has decided to read my posts. Thank you for staying tune for my posts. Thank you all for every comment you have ever made, that not only lets me know that there are people out there reading my posts, but reading and responding. This blog has been a journey that keeps getting better and better, and I thank you all from the bottom of my heart for the view and reads. This year I've decided to host 4 different giveaways, 3 of them will have 1 winner and the last one will have 3 possible winners. Thanks for all the support and here's to another year. My fave post would have to be your Stalking Jack the Ripper review - you convinced me to read it! One of my favourite posts is you're review for "New World Rising". It's still on my wishlist but I really hope I can get to it eventually. Also I always love bookmark swag or postcards, just a few print bids and bobs. One of your reviews that I like because it was just how I felt about the book as well was Labyrinth Lost by Zoraida Cordova. It may not have been this year but I agree with what you had you say in it 100%. One of my favourite release for this year is a graph novel, Wires and Nerve. Thank You for the opportunity :D! Also I loved your post about RoseBlood with the book trailer because I'm dying to read that book! Hi ! First of all, thanks for this giveaway ! I really enjoyed all of this months Readers Response Week posts about different YA genres, gave me a few ideas what to read next. Happy Blogoversary!! Congrats on two years!! I'm so so happy that we got the chance to meet this year. Have I thanked you for introducing me to the group? You also forgot to mention that this year we got to sit down and have dinner with Kelley Armstrong. That will definitely be one of the highlights of my year. Congratulations & Happy Blogversary. Thank you for the amazing giveaways. Is the swag giveaway international? I am soooo excited to finally be delving into your magical, wonderful, world. I just finished Splintered and am about to dive into Unhinged and I am sooo excited to read them all. Roseblood is much anticipated and I hope to someday meet you in person. Happy bloggerversary! I'm a new blogger so way off, but I'm about to stalk your posts to find some new reads to add to my list! Thanks so much for the giveaway chances! Happy blogiversary! Two years down is a big accomplishment. I learned a lot in my 2nd year of blogging! Happy blogoversary! You've come such a long way and I'm excited to see what you come up with in the future! Happy Blogversary! Great bookish swag - mugs, pens, postcards, infograms, posters, jewelry, buttons, fridge magnets. Thanks for the giveaway. Is it international? I am reading Everything Everything. Happy Blogversary. My favorite YA book that released this year was "Caraval," which I just finished reading. Amazing! Love the Author of the Month feature!! I`d love to see bookmarks and a reading lamp in the swag bag. I loved the review of The Names They Gave Us. Such a powerful read! HAPPY BLOGIVERSARY!!!!!!!!!!! and an all around book nerd. and meeting all sorts of bookish people. Share book reviews and ratings with Air Awakens Fan Club , and even join a book club on Goodreads. Share book reviews and ratings with Splintered Fan Club , and even join a book club on Goodreads. Share book reviews and ratings with Library Luv, and even join a book club on Goodreads. Best-Selling author of The Last Magician. Sweet Unrest, Gathering Deep, and Unhooked. she's an English professor at a local college. Library Luv has read 0 books toward their goal of 105 books. Library Luv has read 0 books toward a goal of 125 books. Sabrina has read 37 books toward a goal of 100 books.